Welcome to the Caterpillar room, we provide a specialist self contained unit for babies aged 3 months to 12 months. 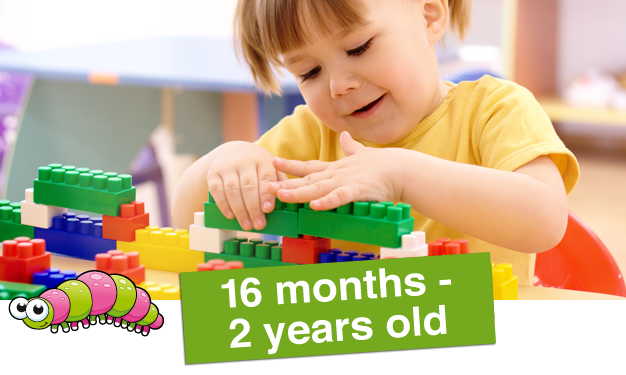 We realize that a child's capacity to learn is probably greater during the first year of life than at any other time. Consequently our staff has been selected according to their experience and knowledge of this age range. They will ensure your child receives ample affection, cuddles and close care at this crucial stage of their development. Babies develop through their senses and we will provide opportunities and experiences to exercise these through play materials, which will. be stimulating. Toys that encourage looking and listening e.g. mobiles, coloured shapes. mirrors, music and singing. Toys of a natural texture to touch and feel e.g. soft cloth toys, wooden bricks and different shaped objects. We realize that children like to discover through their mouths so we will provide toys of different textures and chosen with hygiene in mind. Babies will need periods of rest/steep and we will respect your wishes as regard their sleep patterns and routines. We are fortunate to have extensive gardens to take your baby out for walks to enjoy the fresh air and to explore their surroundings. To meet the individual needs of your child or any changing circumstances our staff will meet with you to discuss care routines e.g. special diet, sleep patterns, comforters and general welfare. Your baby will be assigned a key worker who will ensure your wishes are met in line with nursery policies and procedures. We hope that you will exchange information regarding your baby on a daily basis. Our staff will endeavour to alleviate any worries you may have concerning their care.